It’s home and it’s up! John Reynolds’ work Cloud has come back from its stint at the Auckland Art Gallery for the 2008 Walters Prize exhibition late last year and it is now up and on show in the Contemporary Focus section of Toi Te Papa, Level 5. John came down from Auckland to install Cloud and it went up in only 6 days – we were expecting it to be 12. I guess practice pays off alright. This is the third time John has installed the work and, with the help of the organised and efficient installation, collection management and conservation staff, it went up in record time. Here for your viewing pleasure is a short video edited together by Te Papa photographer Michael Hall from footage shot during the installation. It includes footage of John talking about the work and shots of the completed installation. 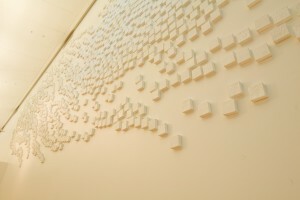 You may know that Cloud was commissioned for the 2006 Biennale of Sydney where it was shown in the entrance hall of the Art Gallery of New South Wales. Then it became part of the national art collection at Te Papa. After that it earned John a nomination for the Walters Prize. 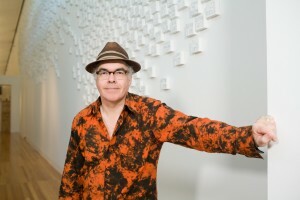 Cloud is also the work that represents John in the forthcoming Art at Te Papa publication. If you are an art follower you are probably already quite familiar with Cloud and the time and effort that has gone into the making, cataloguing, storage and installation of the work. 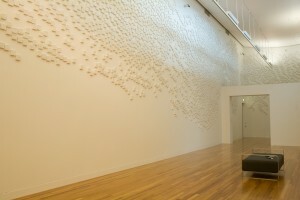 There have been many articles that talk about this major work, including those in Art News, Art New Zealand, and The Listener, and the Auckland Art Gallery blogged about the installation of this and other 2008 Walters Prize works. Cloud also features prominently in the recent publication Certain Words Drawn: John Reynolds Continued. John also made another work using The Dictionary of New Zealand English. The work Looking west, late afternoon, low water, a companion piece to Cloud, uses all the Māori words for the Dictionary. 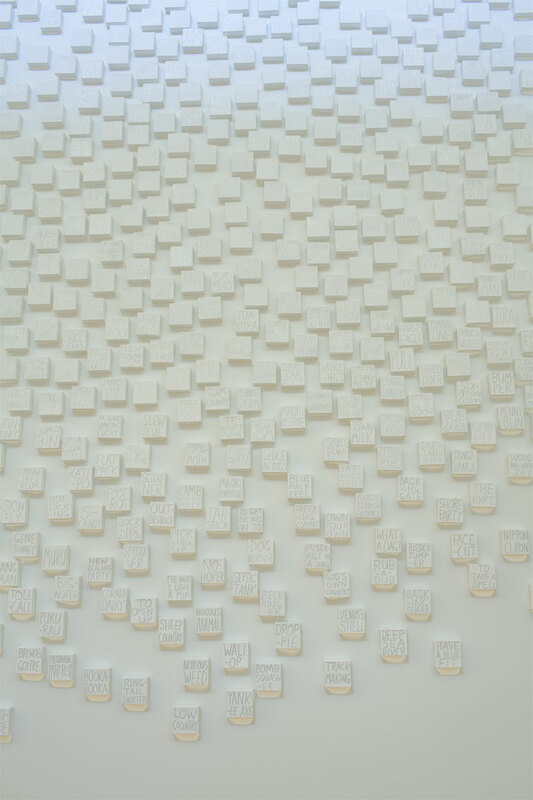 This work is in the Victoria University of Wellington Art Collection meaning that it belongs to the same institution that also houses and runs the New Zealand Dictionary Centre which is the home of The Dictionary of New Zealand English. Cloud is up at Te Papa until late August so there’s plenty of time to come in and do some cloud gazing. In the meantime though if you are a keen cloud gazer you could warm up with some ‘famous clouds’ from artist Douglas Bagnall’s Cloud Shape Classifier, where you can also choose your own favourites and train the software to find them for you. Or you could check in with the Cloud Appreciation Society to see Clouds That Look Like Things. An update for Cloud lovers: John Reynolds’ Cloud is now going to be on exhibition until January 2010. Exact closing date yet to be confirmed, but if you haven’t been in yet, or if you haven’t had enough, there’s more time! Also Cloud will be the focus of the Art After Dark on 20 August. Programme details to be announced. I’ll be sure to post about this – confirmed closing date and Art After Dark as more information is confirmed. Hey thanks Pamela, good spotting! Some of the art works that come up in the search for ‘cloud’ are paintings that are currently on exhibit in the Collection Focus section of Toi Te Papa. (That’s on Level 5 at the opposite end of the high stud exhibiton space). and also two works by Michael Illingworth Untitled, 1971, which is on the cover of the soon to be released Art at Te Papa book. I think this is a truly lovable work. I went browsing on “cloud” in Te Papa’s Collections Online and found some wonderful photos of clouds – Brian Brake, Laurence Aberhart and Leslie Adkin.